I think this is the last of the Mother's Day cards I need to make. I hope so because I need to have them all in the mail tomorrow! This one is for a great friend. I just love this card! I would have never thought of using red for one of the bunches of leaves...what a great touch. Thanks for always sharing your talent with us! Super cute Becky! can't beat that cute Bella Rose Paper! I cased your Blooming with Love card teh other day! Love It! thanks for sharing! Your card is beautiful! I love those flowers with the die cut leaves. That is SUCH a gorgeous card. Oh my! I just found your blog and I LOVE IT! I will definitely be ordering some tutorials. Thank you for keeping them reasonably priced so us little demos can afford them. Beautiful card!! Ijus love it!! gorgeous!!! love the leaves and fleuettes. sorry. brain dead and can't spell today. OMG!!!! This is amazing! I would flip over this if I got it! beautiful colors! great design..gotta get me some of those flowers..LOL! wow just beautiful! OMGosh Becky! This is too cute...I LOVE it...tfs!!! 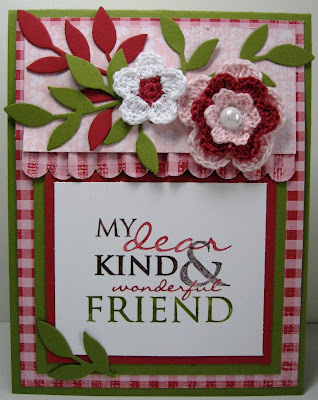 I love this color combo and after seeing it you inspired me to use the same Bella Rose paper for my own mothers day cards. You can see my version on my blog (I mentioned you and a link back to your blog).